Real estate is more rural in nature in the small Vermont town of Hartland. The town is centrally located and is full of lovely hills, valleys, and big view estates and properties. Property owners benefit from school choice where high school students tuition far and wide to various schools locally, across State lines, and even abroad. Mt. Ascutney Hospital, an affiliate to northern New England’s regional medical center is just over the hill in Windsor and the Hartland Recreation Department offers a nice array of seasonal activities for kids and families. Hartland Community Arts is a unique program that encourages interest in the arts in Hartland through sponsored concerts, scholarships for children, contra-dances, and other art-related events. Hartland Community Connections seeks to strengthen the bonds across generations by creating activities that appeal to youth. Other Hartland town groups focus on enjoying the amazing natural resources of the town (Hartland Hill Hoppers and Hartland Winter Trails). The cross-country trails are great in the winter and the VAST trails are used in the summer for horses and winter for snowmobiling. Hartland VT has over 62 miles of dirt roads for horseback riding, running, and even midnight skiing (in a foot of snow). Many residences have extensive real estate holdings and allow others the wonderful outdoor world for exploration right beyond the doorstep. Everything from horseback riding to hunting coexists in this scenic and lovely little town. 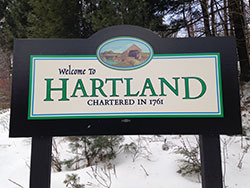 If you are looking for beautiful views, a convenient location, and a slower pace of life, Hartland VT properties are just calling you. Check out Hartland real estate and give us a call!